Original recipe uses 1 tablespoon baking powder and 3/4 teaspoon baking soda instead of bakewell cream and baking soda. Also it uses the unsalted butter instead of shortening. Preheat oven at 400 F (200 C). Combine the blueberries with warm water in a small bowl and set aside for 10 minutes until the blueberries are plumped. Shift the flour, Bakewell Cream, baking soda in to a bowl of a stand mixer fitted with the paddle attachment. Add the sugar and salt. Add the cold crisco by a small pieces over the dry ingredients. Pulse on and off so that you don't break down the butter too much. You want to end up with a coarse mixture with pea-sized lumps. Add the buttermilk, the lemon zest and blueberries and mix gently on low speed. Turn the dough out onto the lightly floured surface. Using your hands, pat t dough into a rectangle about 18 inches long, 5 inches wide, and 1-1/2 inches thick. Brush the top with teh melted butter and then sprinkle with the sugar. Using a large knife, cut the dough into 12 triangles. Transfer them to the prepared baking sheet. 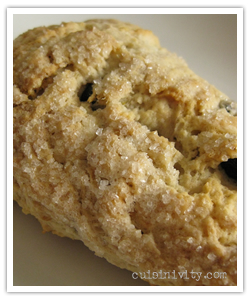 Bake the scones until the tops are lightly browned, 25 - 35 minutes. Remove from the oven and serve immediately.